It’s “Get To Know A Royal” Day! How is the Royals program different than other programs at RiverCity? Being in Royals is different because it’s smaller and it feels like a full band, where we all have to communicate, work together, set up and break down the equipment, plan for shows, pick set lists, and all sorts of other things. Being in Royals there’s a dynamic between every bandmate and you really have to blend and listen to each other to get things done. So overall this program teaches you communication skills to a higher degree than other programs at RiverCity. 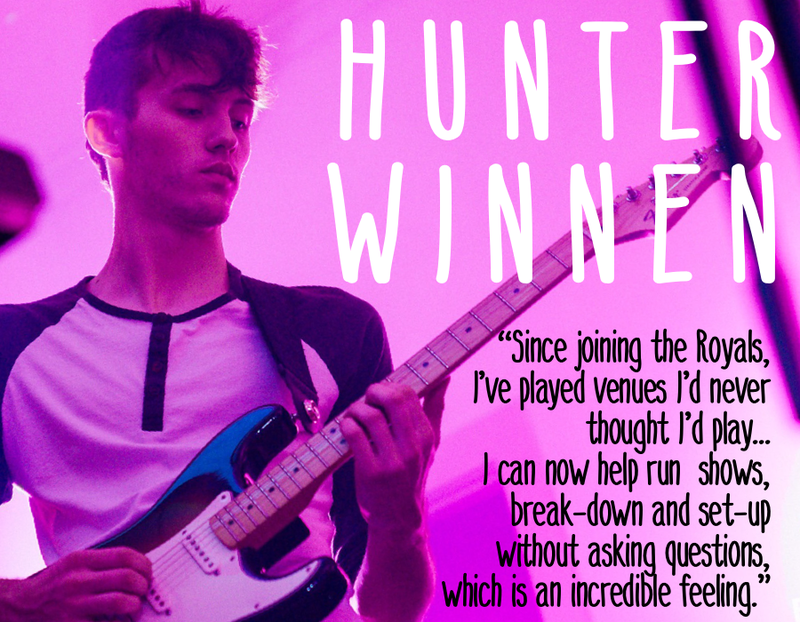 How has playing music and performing helped you beyond the stage? I’ve always been a confident kid as far as public speaking, but it took some time to feel just as confident singing in front of a crowd. Now it’s no big deal with so many shows I’ve done and hope to continue. Royals was the validation I needed to realize I have a talent and gave me the drive to share it with the world. What’s your strategy for learning and nailing so many songs? Practice, practice, practice!!! Every time you just even listen to a song it’s helping you. I make a playlist and just play on repeat till I’m (almost) sick of the song and by that point even if on accident, I have the song memorized. And a pro tip I have is to learn the song as soon as it’s casted so you don’t have to stress out about memorizing lyrics before you go on stage. Being prepared and aware is the best thing you can do to feel comfortable with any song thrown at ya. If you were to describe the Royals in one sentence, what would it be? Patience and practice is the key to being successful in Royals. What things are you involved in beyond the Royals? I’m an active member of my school’s Speech and Debate and have been for the past three years. I also am a Girl Scout and Adventure Scout and have been since I think 2nd grade (it’s been too long to count). I’m also a member of Sprague High School’s French National Honor Society, and on top of it all I’m graduating this year!! So I’m always on my toes and doing something in the community. The RiverCity Royals performance group is an audition-only program for advanced students ages 14-20. The Royals represent RiverCity at numerous community and private events throughout the year. The group is directed by Jarred Venti, bass teacher and music director at RiverCity Rock Star Academy, and musician with several local bands, including Sleep Millennium. Next open audition for the Royals for guitar, bass, drums, keys and vocals will be Monday, September 10th. Contact RiverCity Rock Star Academy for more information or questions about the Royals or the upcoming open audition. 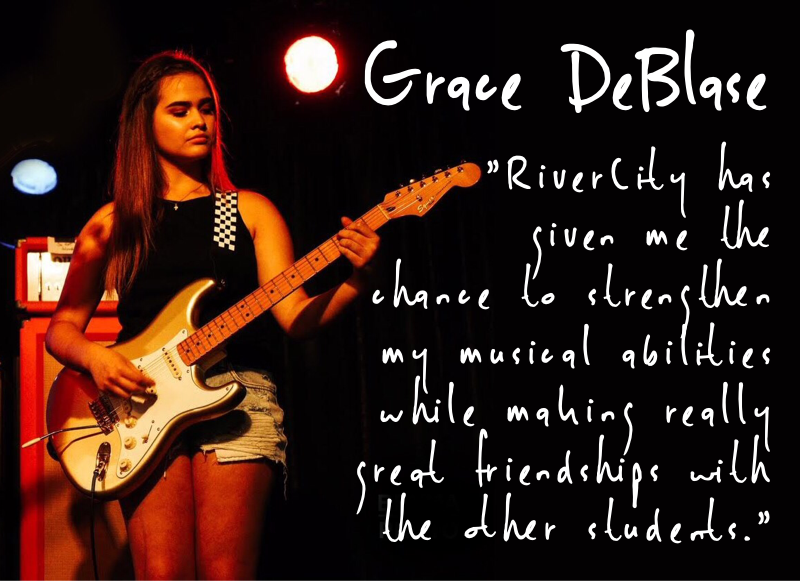 Student of the Week - Grace DeBlase! I started playing music when I was about 7-years-old. I loved the sound of the guitar and I grew up with my dad and brother playing music. My favorite song I’ve played at RiverCity would have to be ‘Semi-Charmed Life’ by Third Eye Blind, because I love the song and the people I was playing the song with. I like how it’s given me the chance to strengthen my musical abilities, while making really great friendships with the other students. My favorite band is AC/DC and Iron Maiden. When I’m not at RiverCity I enjoy cheerleading (I’m on the varsity team at West Salem HS). It's “Get To Know A Royal” Day! When did you start playing music and what made you start playing more seriously (as part of a ‘band’ at RC)? I didn’t start playing music until the summer between my junior and senior year of high school (so it’s never too late to start playing music!). I took an introductory guitar class at Chemeketa Community College and after the first class, I went out and bought my first electric guitar. I started playing more seriously when I joined RiverCity. Knowing my music for shows was important to me and being in that environment helped me realize my goals of being a musician. What’s your favorite thing about being in the Royals? And the least favorite thing? My favorite thing about the Royals is probably the experience. Since joining the Royals, I’ve played venues I’d never thought I’d play. And I’ve learned so many new things. I can now help run shows, break-down and set-up without asking questions, which is an incredible feeling. I think my least favorite thing about being part of the Royals is trying to work around everyone’s availability for shows (and extra rehearsals, if needed). Everyone has a lot of other things going on outside of the Royals (like jobs, school activities, other bands they’re in) and sometimes it can be hard to work around all of that. Somehow though, we make it work! You’re sometimes referred to as the ‘cheerleader’ in the group and the other Royals and Jarred really appreciate your positive attitude and just having a great time playing music. Would you agree and how does that make you feel? I believe having fun playing music and loving what you’re doing should really be the root of anything you do. If you’re not enjoying your hobby, what’s the point of doing it? I think it’s pretty cool that having fun and being happy is what I’m known for! Jarred Venti, the Royals Music Director, is involved in Salem’s music scene as a performer in several bands, including Sleep Millennium, and is a highly respected musician. Tell us about your experience working Jarred. Working with Jarred has been fantastic. I’ve heard a lot of great things around Salem about him and I’ve come to learn they are ALL true. I’m incredibly fortunate to get the opportunity to work with someone like him in this industry! The things Jarred has taught me I will never forget. What advice would you give someone that is thinking about auditioning for the Royals? KNOW YOUR MUSIC. It’s a real audition! I practiced for at least three weeks before my audition and that was almost not enough for me!! Pay close attention to every detail you hear and practice as much as you can! Outside of the Royals, I also work for RiverCity as an intern and get a chance to shadow the teachers to learn everything about setting up shows, lighting, and sound. I’m also a barista at a coffeehouse in South Salem. In my free time, I work on computers, practice my music, bike ride and I like to take things apart and learn how they work. It’s been a really busy summer this year! The Royals performance group is an audition-only program for advanced students ages 14-20. The Royals represent RiverCity at numerous community and private events throughout the year. The next open audition for the Royals for guitar, bass, drums, keys and vocals will be Monday, September 10th. Contact RiverCity Rock Star Academy for more information or questions about the Royals or the upcoming open audition.